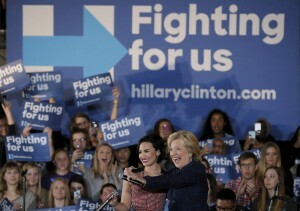 IOWA CITY, Iowa — Hillary Clinton has a lot of celebrity pals on her side, like actress Lena Dunham and singers Katy Perry or Demi Lovato, the latter of whom belted out hits at a campaign concert at the University of Iowa. It’s a play to help the former secretary of state connect with younger voters. But so far, the star power isn’t swaying the college set. Many say they prefer her rumpled 74-year-old rival, Vermont Sen. Bernie Sanders, regardless of whether he got star power behind him or not. The push for younger voters comes amid an intensifying battle for the Democratic nomination. While Clinton and Sanders are locked in a tight race in Iowa, and Clinton has held the lead nationally, Sanders has a clear advantage among younger voters. A recent Des Moines Register/Bloomberg Politics Iowa poll forecast that Sanders will have 59 percent of Democratic caucus-goers 45 and under, compared to the 27 percent expected to back Clinton. And in the latest CBS News/New York Times poll Sanders led 60 percent to 31 percent among Democratic primary voters under 45. Sanders has collected some celebrity buddies too. Actress Susan Sarandon and actor Justin Long are appearing at Sanders rallies in Iowa ahead of the Feb. 1 caucus. The campaign also has a number of celebrities doing media outreach on Sanders’ behalf, including hip hop artist Killer Mike and musicians from the bands Foster the People and Vampire Weekend. But Sanders is drawing big student crowds without them on the bill. It’s not that the students were negative about Clinton — they simply like what Sanders has to offer more. They are packing his rallies by the thousands because they like his push for free tuition at public universities and his long record on liberal issues. They like that he doesn’t take money from political action committees. They even dig his rolled-up shirt-sleeves and his grumpy grandpa demeanor. “Bernie gets me stoked,” said Ian Wold, 20, a junior at the University of Iowa who plans to vote for Sanders in the state’s kick-off caucus. It’s not that the students were negative about Clinton — they simply like what Sanders has to offer more. The fight for younger voters harkens back to the 2008 race, when Clinton lost the youth vote to President Barack Obama. While younger voters tend to be less reliable participants, they can make all the difference in a close race. In addition, young enthusiasm helps a candidate project momentum. Celebrities have been campaigning for Hillary for months. Wearing an American flag cape and a Clinton campaign pin, pop starlet Katy Perry performed at a Clinton rally in Des Moines in October. Actress Lena Dunham toured Iowa and New Hampshire and did events in Boston and Chicago for Clinton this month.